The US Food Policy blog has an intriguing expose on Quizno's Prime Rib sandwich promotion and it's ties to the US Beef Board and the USDA; and, of course, Quizno's continued refusal to release nutrition data for their products. In short, Quizno's has partnered with the Cattleman's Beef Board, a controversial quasi-governmental agency under USDA auspices, to promote a sandwich that is at odds with the USDA itself in that it does not supply nutrition data for the sandwich...data needed by consumers in order to follow the guidelines set forth in the USDA's much promoted new Food Pyramid. Also, check out a photo of the actual sandwich at the Impulsive Buy and compare that with Quzino's official photo! Regular readers of Fast Food News will be familiar with the Quizno's Prime Rib sandwich and our frustration with Quizno's refusal to supply nutrition data. I think the photo of the real sandwich looks much more appetizing than the advertising photo. The reason they will not give nutritional information is because they are false advertising their product. 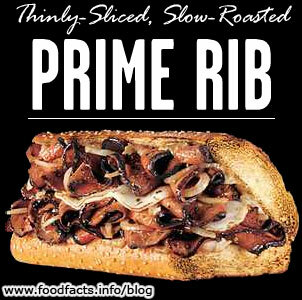 Quiznos uses Commercial Rib-eye for their steak sandwiches. Call any meat packer in the Denver area and they will tell you Quiznos bought them out of all of their commericial rib-eye. I'm sure the sandwich isn't exactly healthy, anyone with half a brain could figure that out. I tried one for the hell of it, and I was dissapointed by the lack of taste more than anything. The sandwich looked very presentable. It had very little tast to it, almost like the beef had been boiled all day. And I don't know what was in their sauce, but I could hardly taste that at all. About all I could taste was the bread.